Only when she heard the door open, did she remember she’d forgotten to lock it. For a few seconds, the fear that accompanied her most of her life returned in a surge. Then she saw the figure in the doorway and relaxed. It was always good to see a friend. That’s why the first blow caught her totally off-guard and sent her reeling. “Why?” was the question she struggled to utter before another blow rendered the answer irrelevant. Clara was dead. So begins Murder on Cinnamon Street, the first book in my second cozy mystery series. Like the characters in Snoop, the first book in another mystery series, the characters in MOCS (as my publisher Patricia Rockwell of Cozy Cat Press has dubbed it), live in a small Michigan town. This time the town is Camphor, Michigan. I think the name is perfect since most all cozies are set in sleepy small towns which wake to startling truths once murder rears its ugly head. For many reasons, small towns are the perfect homes for this popular genre. One reason is that you need a setting in which gossip spreads like wildfire. Anyone who has ever lived in a small town, and I lived in two when I was growing up, knows that they are places where myths quickly become truths. In Murder on Cinnamon Street (MOCS), myths regarding the unmarried, overprotected, and totally-reclusive Clara abound. Her murder is the catalyst for truths to be revealed and lives to be destroyed. Just as in real small towns, people in Camphor continue to live their lives, i.e. carry on petty fueds and begin love affairs, as death and danger swirl around them. Another reason the small town and the cozy mystery are a perfect match relies on a misconception. Because small towns have the “less-sophisticated” tag, they are seen as a breeding ground for rumor and scandal. If you’ve lived in both small towns and larger towns and cities,you know that the only real difference is size. But size does matter. Though certainly rumor and scandal punctuate larger towns and cities, the idea of knowing what your neighbor is up to is less credible when buried in anonymity. Cities like to see themselves as above such a base pursuit as spreading gossip. Not true, but if you want to involve your reader quickly in your premise, then you put your cozy in a small town where it’s more believable that people are peeking out their windows or whispering in coffee shops. In Murder on Cinnamon Street, Clara has a past much like that of a young woman in the town in which I grew up. But as a young girl, I heard about her and formed my own ideas regarding why she had been sequestered by her parents, shut away from the wagging tongues of people who had way too much time on their hands and took a certain perverted pleasure in destroying a young girl’s reputation. So I started my book with the memory of that town and that young girl. All I really knew was that once in her adolescent life, she had done something perceived to be so bad that her parents closed her off from the world. The writer in me then had the fun of expanding the legend into small Camphor’s reality. The girl I knew was no more than fifteen or sixteen. Though I added no new information concerning her, I let Clara grow into a woman in her sixties. The house at the beginning of this blog looks like one of the houses I lived in and is very similar to the houses that reign on Cinnamon Street. Small towns in Michigan have these houses rich with history. 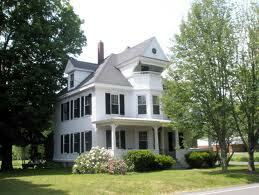 My main character Elizabeth Catherine Clary (E to her friends) lives in one of Cinnamon Street’s majestic Victorians. Down the street and next to each other, her late mother’s two best friends Mignon Dalton and Madge Bobik live in even more elegant homes. And at the far, far, end of Cinnamon Street living palatially is the quirky, old bachelor Maurice Brunson, of the rich, powerful, and dominant Brunsons. These are the people who occupy the pages of MOCS and whom the gossipy little town watches with curiosity, greedy for news to swallow and regurgitate. My father exhibited a savvy understanding of the nature of small towns over forty years ago when he said to his five children,”This town waits for you kids to run downtown and grab the gossip so you can spread it all over.” But it wasn’t just us. It’s what everyone did, and it’s what the characters can be depended to do in Murder on Cinnamon Street. I suggest, however, that gossip sometimes serves a purpose. Once in a while, it can stop a vicious killer from annihilating an entire town, just as in does in Murder on Cinnamon Street. This entry was posted in Cozy Cat Press and tagged cozy, murder, mystery, romance., suspense, writing by Lyla Fox. Bookmark the permalink.